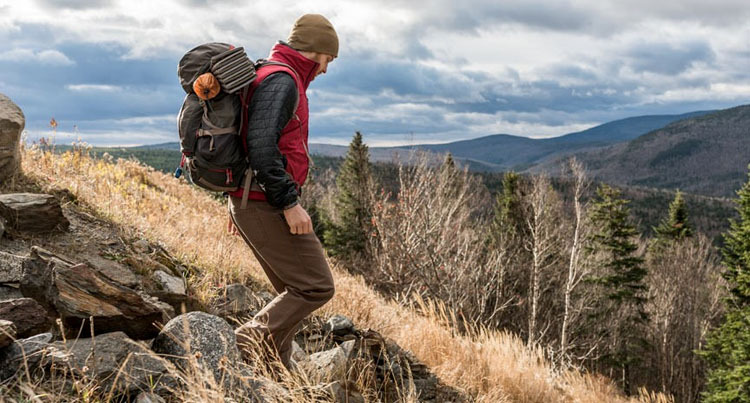 If your mind is set on hiking minimalistic style, a thru hike backpack is the pack to go. Just because you’re travelling light though, doesn’t mean you have to compromise on the comfort or durability, though. The lighter you want your backpack to be, the more you need to give on the idea of multiple pockets or zippers, as they add too much weight. You want your thru hike pack to still have a well thought out design as it’s quite important to have easy access to your items at all time. Less pockets doesn’t mean no pockets at all, and you still may want at least a mesh front pocket for some small items. A good thru hike backpack doesn’t weigh much, but it’s made with tough materials so it can hold a 20-30 pounds’ load. This means your backpack should be somewhere between 40 to 69 pounds’ capacity. Go for a compact pack that is lightweight, though. The best thru hike backpack is in the end the one that fits the most your needs and likings. You may want it to have several attachment options or to be waterproof so knowing what you want and being willing to pay for it is essential. The great balance of the weight on the Granite Gear Crown VC 60 Backpack is one thing to consider when getting it, but the backpack comes with so many other good things attached to it. Presenting an internal hydration sleeve an hydration ports, it’s quite obvious the pack comes hydration ready. The design is well thought out and the backpack comes with interchangeable belts, lineloc compression and tool loops. The organizing options aren’t that bad either and the pack comes with large stretch side and front pockets to accommodate all sorts of items. The extended overflow crossover straps give you more control over the volume, whereas the padded rolling stay is well made. The pack has a top opening for easy access to your belongings and it’s easy to adjust. It has a sturdy build and gives you space for everything you need and more. It comes in various sizes for men and women, for the best fit. 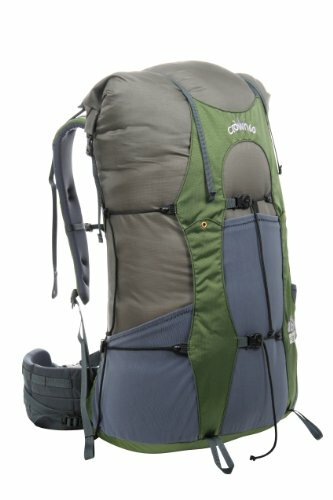 All in all, for a fair price, you get a dependable and comfortable pack for your thru hike experiences. 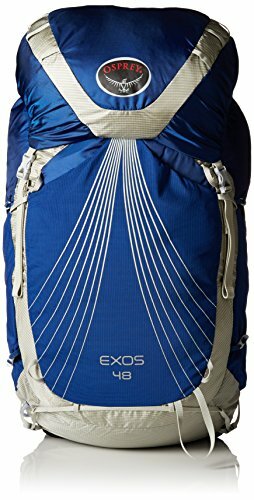 The list of features on the Osprey Packs Exos 58 Backpack is pretty impressive and the backpack is a great choice for the thru hikes. We begin its description with the sewn-in back panel sleeve with attachment clip and you may carry even a 3 L water bladder. The peripheral frame is made with 6065 aluminum alloy with an internal suspended cross strut, ensuring efficient support for your load. The ExoForm is sewn-in and the pack features EVA foam padded harness that is both comfortable and breathable. The seamless layered mesh simply increases your comfort when on the move. The hip belt is also sewn-in and has a seamless layered mesh covered foam so the strain for your back is minimal. The hip belt tightens with a forward-pull cinch closure and has pockets as well. The lid of the pack is easy to remove, whereas the over-the-top compression straps help you better secure the main compartment. If you’re going lidless, you may easily use the build-in Flap Jacket to protect your personals. The shoulder harness is breathable and supportive as it’s made with slotted, mesh-covered foam as well. It comes with an adjustable sternum strap, a pocket and a built-in whistle for emergencies. The pack gives you plenty of organizing spaces and you may use the front and side stretch woven pockets, the zippered mesh hip belt pockets and the under-lid pocket for all of your gear and essentials. The sleeping pad straps are easy to remove, whereas the tool attachment features cord tie-offs for you to strap an ice axe or other gear. 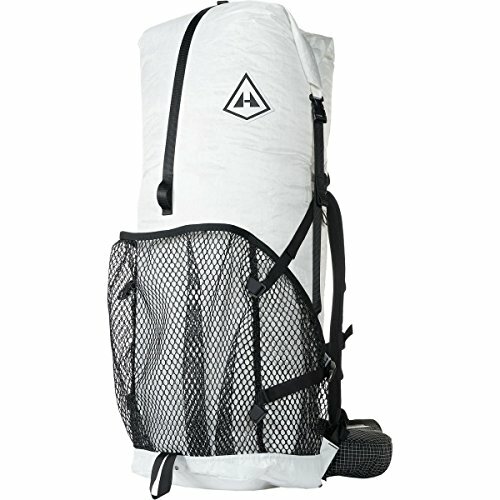 No matter the flaws, for the good build, impressive list of features and reliability, the pack is a good investment of your money. Especially designed for women, the Osprey Women’s Aura 50 AG Backpacks should be put on a list next time you’re shopping. The backpack stands out not simply because of its features, but also due to its pretty looks, which have a lot to say, we have to admit. The Osprey’s Anti-Gravity suspension system is efficient and it includes a seamless back panel that is made of lightweight mesh. The mesh is used from the top of the back panel all the way to the hip belt so that it contours to the body, for a better fit and more freedom for you while thru hiking. The fit-on-the-fly hip belt helps with the balance of the weight, whereas the adjustable torso length is great for a customization of the pack. The hip belt extends 5 in. so that’s enough for most out there. The backpack also comes with a top lid that is removable and easy to access. The whole design is well thought out and you have easy and quick access to your essentials through the top of the pack and the zippered front panel. On a rainy day you may use the flap jacket to protect your gear and the stow-on-the-go trekking pole attachment system for an easy attach and carry of the trekking poles. As it comes with internal compression and compression straps, the backpack lets you control the volume of your load at all times. Regardless of the flaws, the backpack is still a great choice for women when thru hiking. 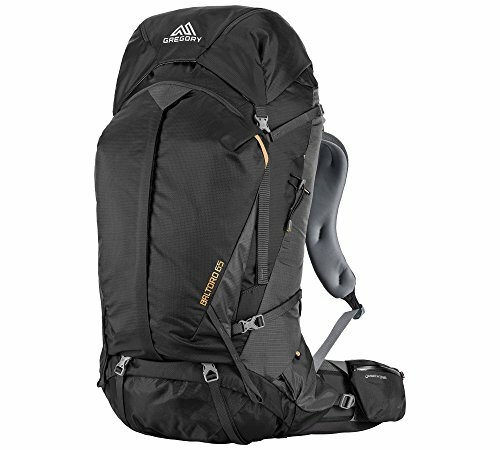 Award winning and dependable, the Gregory Mountain Products Baltoro 65 Liter Men’s Multi Day Hiking Backpack is going to impress you on so many levels. It’s the winner of the Backpacker Magazine’s 2015 Editor’s Choice Gold Award and the Outside Magazine’s 2015 Gear of the Year Award. The pack is made with 210D nylon and 420D HD nylon so it’s quite ready to take a beat. Its design is essential for your comfort and the pack has pre-curved foam components. It presents a Quick Swap 3 D interchangeable pre-curved LifeSpan EVA foam harness and hip belt in various sizes, for a better fit. The SideKick removable daypack is very lightweight and you may use it as a hanging reservoir sleeve when in need. The pack has a top-loading design with front U-zip panel access. It also includes a removable rain cover that comes in its own zippered pocket. The storage space is generous and the organization isn’t bad at all. The Double Barrel lid design includes two zippered pockets on top, but you may store the more important personals in the security pocket underneath. The SideWinder bottle holster has an ergonomic shape and it’s easy to stow. The Response A3 suspension system ensures better balance of your weight and the back panel is vented for more comfort. The lumbar tune insert is easy to remove and the 10mm insert sustains a user-customizable contouring for best back panel fit. Despite the minor issues, the pack isn’t to be missed on whenever on a hunt for a good thru hike backpack. Even though you may feel like paying a bit more than you wanted to, the Hyperlite Mountain Gear 3400 Windrider Backpack – 3356cu in is a great thru backpack and doesn’t disappoint at all. The pack is made with Dyneema (one of the strongest fibers out there at the moment) which explains its durability, for sure. The suspension sis good and the aluminum stays are removable. The back panel is well padded which increase your comfort while on the move. The shoulder straps come with sewn-in spacer mesh and a 3/8in foam layer so the pack feel cozy no matter how heavily loaded you may be. The backpack has plenty of features that minimize the strain on your back and shoulders. It comes with waist belt and in several sizes, for the best fit for short torsos, including women. The build of the pack is impressive and the seams are taped so the water resistance is quite impressive. The pack is also resistant to puncture or abrasion, taking the more difficult conditions. The backpack comes with side water bottles that are easy to replace and to reach while wearing the pack. The roll top closure makes access easy and fast, whereas the side straps ensure efficient compression of your load every time. The backpack is lightweight and comfortable and its suspension system is efficient. The loop for attaching ice axes is a great detail, whereas the external mesh pockets and the zippered waist pockets help you organize better your personals. All in all, for the great build, features and looks, you should put your money at stake with the pack.